That's Michigan's triple overtime touchdown. The Illinois player who looks wildly out of position is their defensive end that ran directly upfield. Webb is about to block Illinois' blitzing linebacker. Touchdown. Purdue deployed a similar tactic, but rather than blitzing the zone vacated by the defensive end, they blitzed up the middle of the formation, opening up the 19-yard Vincent Smith rush. The really interesting thing here is the read that Denard makes. 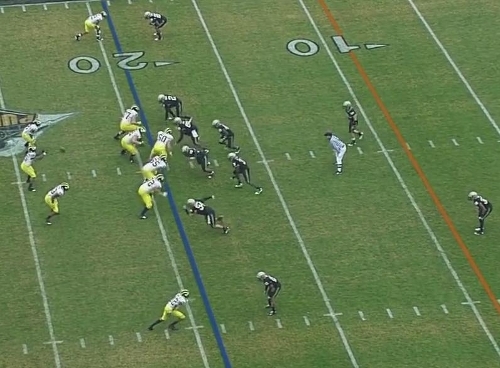 Michigan is in a three-wide set with Vincent Smith and Michael Shaw in the backfield. 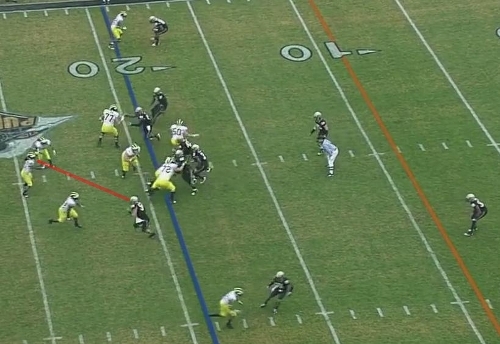 Purdue is in their base 4-3 with a linebacker over Roy Roundtree in the slot. Ryan Kerrigan is in a 9-tech defensive end position (outside the tight end, which in Michigan's formation isn't actually on the field). On the snap, Kerrigan rushes directly upfield. 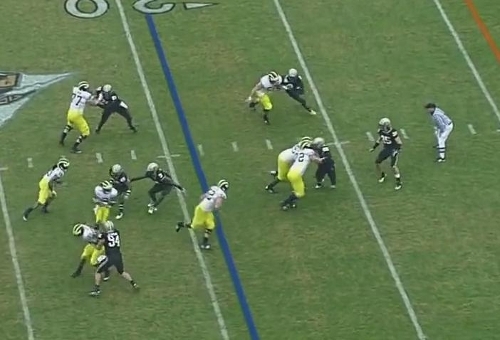 Michigan's offensive line leaves him unblocked and assigns Shaw to chip block him. Steve Schilling will pull across the formation as a lead blocker for Smith. David Molk is sealing the weakside defensive tackle to the outside while Patrick Omameh and Mark Huyge will double team the playside defensive tackle. The two linebackers will blitz up the middle of the line. 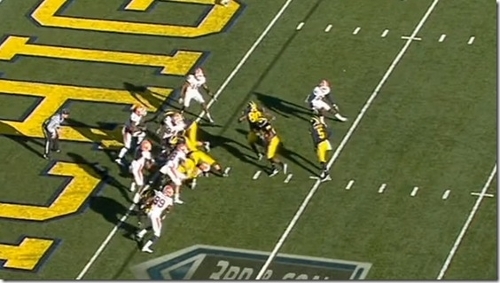 Denard now turns his eyes to the inside where there are two linebackers blitzing the A-gap. Molk is lost in space but moving downfield to block the weakside defensive end who had dropped into coverage. Shaw is doing his best on Kerrigan, and Huyge and Omameh are doubling the playside defensive tackle. Lewan effectively gets a hold of the weakside defensive tackle. If he hadn't, this play would've ended in disaster. With the two linebackers coming straight at Denard/Smith in the mesh point, Denard holds the fake a little longer. 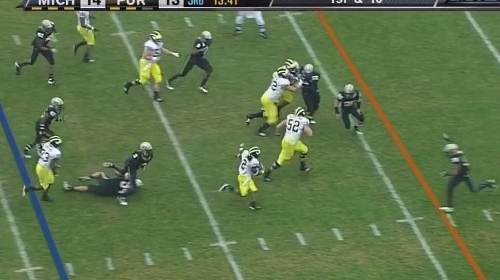 The linebacker is now starting to cheat to the weakside of the field in case Denard pulls the ball. After handing the ball off, the linebackers are trying to get back in position, as is Kerrigan who rushed upfield and is shedding the Shaw block. 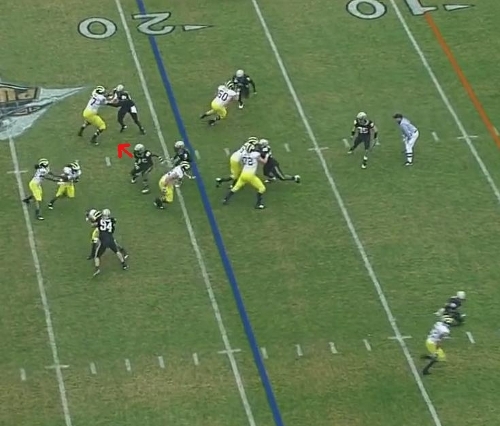 Schilling is the pulling blocker that opens up the final lane for Smith to run through. There are a few interesting things here. Michigan clearly gameplanned for Purdue to send their defensive ends upfield and made sure they had a blocking scheme for it. 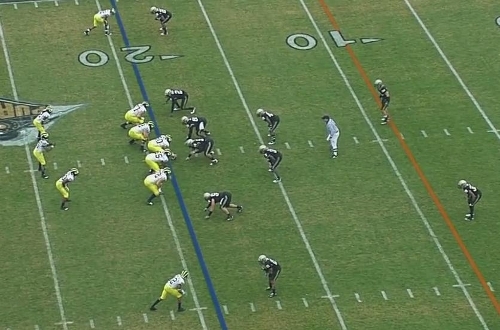 Since they did, Shaw stayed in the backfield to chip Kerrigan, and Denard was supposed to read the blitzing linebacker. If Kerrigan didn't run into the backfield, Shaw would've been responsible to block the unblocked linebacker, and this probably would've been a passing play (about more which in a second). The next thing to notice is who Denard was reading: on a lot of the plays that look like direct handoffs, Denard is actually reading the linebackers like he does here. Most of the time, linebackers aren't crashing down on the play, so it looks like a direct handoff. But here, Denard is forced to make the read, and fortunately makes the proper one. The most frustrating thing for Purdue here, is that if the linebackers had attacked Smith instead of Denard, this is probably a four-yard loss. You can see in some of the early screen captures that the receivers are actually running routes, not blocking downfield for a run play (much like the Roundtree touchdown against Notre Dame). This means that if Denard keeps the ball here, it's probably a pass play in which there's significant penetration into the backfield. Instead, Denard is able to bait the blitzing linebackers into playing him instead of Smith, opening up the running lane. Frankly, there's a lot of stuff going on here and it's difficult to sort through. I'm usually fairly confident that I know exactly why a play happened the way it did, but I'm a little less sure of this one. Anyone with some expertise, feel free to let me know if there's something I'm missing here. Chris, are you sure Molk's responsibility here is the weakside DE? 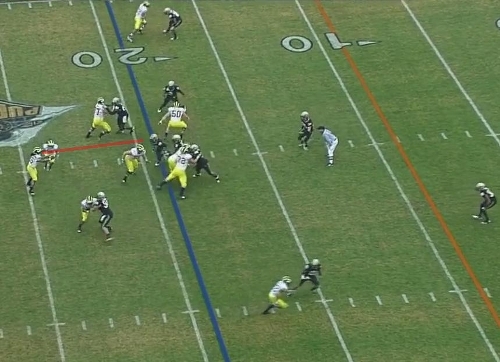 He looks lost in the video in space; I thought maybe he should have picked up one of the LBs blitzing the A gap inside. Also, Denard takes 2 steps to the playside to help Smith get some momentum and wait until the LAST split second to hand off the ball. I think this is an adjustment made to the upfield DEs and reading the LBs to make sure the LBs really commit before he finalizes his read. Molk's responsibility here is to seal the weakside defensive tackle (not DE). But the tackle runs a stunt past Molk who is, yes, totally lost in space and eventually runs downfield to block the weakside DE who had dropped into coverage. I think when the DT stunted, Molk expected to see the DE rushing at him, and when he wasn't, he starts heading upfield. 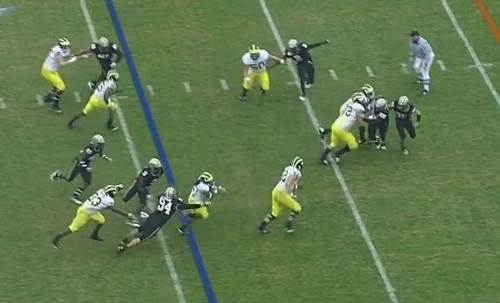 Fortunately, Lewan was able to get a hold of the weakside DT and Denard juked the pants off the linebackers. great job by shaw to stand up to Kerrigan. How many 185lb RBs can get left on an island with a top 5 DE draft pick and stop him from making a play. Too bad later it looked like shaw got a another concussion. There was a great shot of his last play and he was real wobbly after the hit. Isn't the other runningback Hopkins, not Shaw? Looks like a 33 to me. Great job on the picture pages. These are always some of my favorite things to read during the week. Good eye, it is Hopkins. Don't know how I missed that; it's pretty clear.